I found this beauty at our small, community post office. People have started painting rocks and hiding them to spread beauty, kindness, and bring a bit of happiness to the person who finds it. I will be hiding this today and hopefully it will bring someone else a moment of joy. Are you a fan of the Golden Girls TV show? Well, even if you are not I think you will enjoy this peek at Rue McClanahan's home that's up for sale. Why yes, actually, I do believe I need a watermelon dress. Leaving you with a great song and the tambourine guy is a source of entertainment on his own. I don't know, but the house seems a little on the small side. Cozy though. hello, the watermelon dress is funny. I love Rue's house, just a little too big for me. Happy Friday, enjoy your day and weekend! A watermelon dress might be fun. The past two weekends the Electric Forest was in full swing a few miles from us. 40,000-50,000 "rock lovin' hippie types" from all over the country move in. noticed a rack of hippie like shirts, dress, throws. I think I need one for next year . . .
We have never attended, waaay to costly at 350 for one weekend! Plus we are into a different kind of music. Loved your colored rock find. and then place them on the bike trails and other walkways to greet people. by painting a rock of your own and return it to the place where you found your rock. A Pay It Forward kind of thing . . .
i keep hearing about this rock thing, it is wonderful. when i take the girls to mcdonalds, i eat salad and i steal fries from the girls. they are just amazing and i hate that i love them!!! What a nice thing to do, painting and leaving rocks around town to bring smiles to people. Did I tell you I wrote pretty many articles for Mature Living? I see you did too. That is quite the beauty. Someone will definitely appreciate finding this gem. I've not heard about the rock thing but it is a lovely idea. That is some house. WAY TOO BIG for me!!! Spreading joy with rocks, what a lovely idea. OH.. and I love the painted rock.. you're talented! As usual, a great Friday 5. I'm ready to drive up to Vancouver BC to see if I can get a Potato Rosti Burger! Yes! :-) And the painted rocks to find ... what a great idea! Thanks, as always, for sharing. Neat little rock art! I like that song too! LOVE the painted rock and the watermelon dresses are hysterical! Oh what a pretty rock! Our area started hiding rocks too. 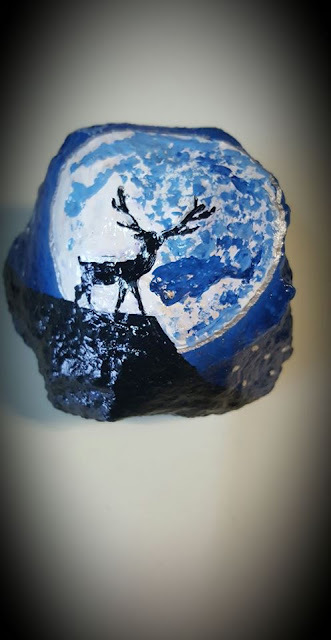 I started painting rocks and discovered I have a hidden talent. My friend SRQ sent me here to see the one you found. I love it! That is a pretty rock, and I love the tambourine guy! I keep hearing about the rocks but haven't found one yet! I've heard that the painted rock craze is spreading - it's so fun and this one is very pretty! I'm not a fan of the Golden Girls. What a house! I think the curly fries look good.